For Rex Tillerson, Russia was the proving ground that helped vault him to leadership of a company whose annual sales dwarf the economic output of most nations. Tillerson, Exxon Mobil Corp.’s chairman and chief executive officer since 2006, has emerged as President-elect Donald Trump’s favorite for secretary of state despite, or perhaps because of, a long record of engagement with America’s former Cold War adversary. In the late 1990s, when serving as a vice president for Exxon’s Russian unit, Tillerson helped revive a $17 billion oil development in a remote region east of Moscow that’d been stalled by bureaucratic inaction for most of a decade. The project, which tapped a cluster of #oil discoveries beneath the ice-choked seas off Russia’s Far East, became a crown jewel in Exxon’s global portfolio, pumping hundreds of millions of barrels of crude since the first wells came online in 2005. The achievement burnished a resume already chock-full of successes helping direct Exxon’s forays in the Middle East and Southeast Asia. “Russia made his career,” said Joseph Pratt, a University of Houston oil-industry historian, in a 2015 interview. Tillerson’s success in turbulent late ’90s Russia “really impressed” Exxon’s leadership team at corporate headquarters in Irving, Texas. Trump said he’s “very, very close” to naming his secretary of state and lauded Tillerson in an interview broadcast Sunday on “Fox News Sunday” as “a world-class player.” Tillerson joined joined Exxon in 1975 after graduating from the University of Texas with a civil-engineering degree. If named as secretary of state, he would be the first oil executive and only the second Texan to hold the office. A person close to the presidential transition said Trump has not formally offered Tillerson the job but is likely to do so. The move would hand top diplomatic powers to a man whose ties to Russian President Vladimir Putin go back to 1999. An announcement is expected in the next few days, according to the person, who asked not to be identified discussing internal deliberations. Tillerson met with Trump for more than two hours on Saturday. Some senators, who must confirm Tillerson if he’s nominated, are balking. Republican Senator John McCain of Arizona said in an interview on Fox News that Tillerson’s past relationship with Putin “is a matter of concern to me.” Fellow Republican Marco Rubio of Florida, who sits on the Senate’s Foreign Relations Committee, wrote on Twitter that “being a ‘friend of Vladimir’ is not an attribute I am hoping for” from a secretary of state. 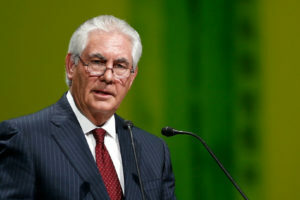 Exxon spokesman Alan Jeffers declined to comment on Tillerson’s candidacy or the company’s succession plan, although the chief executive will hit Exxon’s mandatory retirement age of 65 in March. Exxon’s board promoted Tillerson to president in 2004, signaling he was in line to succeed Lee Raymond as chairman and CEO. Tillerson was a surprise pick at the time, edging out older rival Edward Galante for the top job in an organization that puts a premium on experience, said John Stuart, a former vice chairman of Guaranty Bank in Dallas and friend of several prominent Exxon executives. Tillerson formally assumed the CEO role in January 2006. Tillerson’s easygoing manner and personal warmth were a welcome change from Raymond’s famously brusque leadership style, according to three current and former Exxon employees who asked not be identified discussing the corporate environment. At a shareholder meeting at Dallas’s symphony hall, Tillerson once joked about moving the annual gathering to Luckenbach, Texas, a country-music mecca memorialized in Waylon Jennings’ 1977 song. Tillerson’s relationship with Russia evolved in the years following the Soviet Union’s collapse in 1991. It was a time when Exxon saw its efforts to explore oil-rich zones in Russia’s interior frustrated by bureaucratic hurdles, including the inability to garner permits or drilling licenses. In response, in-country executives including Tillerson decided to pursue a “peripheral strategy” that focused on projects on the nation’s edges, close to ports that could export crude as soon as it was pumped out of the ground, according to Pratt. Sakhalin 1 was a prime example of a project on the periphery. It was on Sakhalin Island in 1999 that Tillerson first met Putin, when the Russian leader’s plane stopped there to re-fuel en route to Japan. Not long after that tete-a-tete, Sakhalin 1 began rolling forward again, ending eight years of suspended animation. The “time I spent in Russia got a lot of people’s attention,” Tillerson told Pratt and William Hale in “Exxon: Transforming Energy: 1973-2005,” a company history they co-authored that also drew on corporate archives housed at the University of Texas. Kremlin spokesman Dmitry Peskov said Monday that Tillerson “quite professionally fulfils his duties” as head of Exxon. “Any sympathies fade to the background and the only thing left is the readiness to demonstrate a constructive approach and show professionalism,” he said, insisting that his comments related to whoever becomes secretary of state. Tillerson had caught the eye of senior managers grooming future leaders as early as 1992, when he was summoned to Exxon’s corporate headquarters to vet new oil production proposals for the management committee of senior vice presidents that oversee day-to-day operations along with the CEO. That was followed by a two-year assignment to Yemen, where he renegotiated a natural-gas concession, and then a stint handling international gas sales in Thailand and elsewhere. “He had handled himself well in a series of nations characterized by high political risks,” Pratt and Hale wrote in their book. Tillerson’s relationship with Putin reasserted itself in 2011, when Exxon signed a multibillion-dollar deal with Kremlin-controlled Rosneft PJSC to drill Russia’s vast Arctic, shale and deepwater fields. The historic agreement led to a billion-barrel oil discovery in the Kara Sea off northern Russia in 2014, but the project was halted shortly thereafter when the U.S. and European Union levied sanctions to punish Russia for annexing the Crimea in Ukraine and aiding Ukrainian separatists. At the time, Tillerson expressed doubt that sanctions would prove an effective foreign policy tool.